Originally from Milwaukee, WI, Catherine Nevels earned her associate of nursing degree from Bryant & Stratton in 2009. Shortly thereafter, she received her bachelor's degree in nursing from Chamberlain University in 2010. 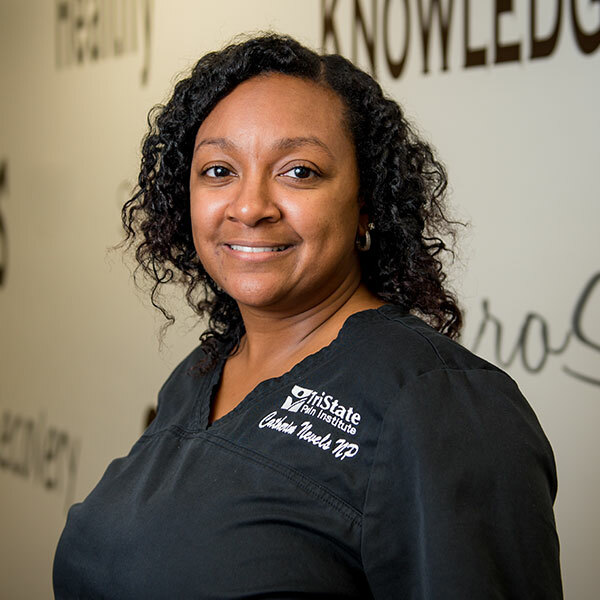 Catherine completed her master's degree in nursing in 2017, is certified by the American Nurses Credentialing Center, and is a member of the Sigma Theta Tau International Honor Society. Catherine has years of experience as a nurse, having traveled as an ICU travel nurse, worked as a staff nurse, then clinical coordinator of the ICU at Piedmont Rockdale in Conyers, GA. Catherine saw firsthand the need for individualized, compassionate, and holistic pain management after her husband was poorly diagnosed and treated for chronic pain associated with rheumatoid arthritis. She is committed to efficient diagnoses and comprehensive pain management for patients to optimize their lives. Catherine is new to the Tristate area with her husband of 15 years and 12-year-old son and enjoys off-roading in her spare time. She brings with her a wealth of critical, clinical experience and a passion for caring for patients to achieve effective pain management.